Families with homes along the Ohio River woke up this morning, shocked to find their backyards covered in water. Due to greater-than-average snowfall, followed by greater-than-average rainfall, the Ohio River has grown to surprisingly greater-than-average levels. Entire communities have become flooded as the waters have continued to rise over the past few days. Sandbags are in short supply, as are Wet-Vacs, oars, and dry underpants. 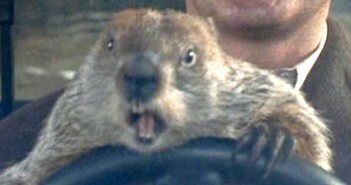 Groundhog Day had a confusing reading by Punxsutawney Phil today as the rodent of revelation never left his hole and is presumed dead. Visitors of Central Park were caught up in a nightmare Sunday as F-16 Fighting Falcons were deployed and shot down a plane flying in restricted airspace. The pilot of the rogue plane, 8 year old James Foldrieg, was guiding his wooden, rubber-band propelled glider to what local authorities assume was The Metropolitan Museum of Art, his target. Capt. Reginald Watson was radioed about the renegade plane during his flight from the McGuire Air Force Base in New Jersey, and promptly sighted and shot it down using AIM-120 missiles. “The little wooden glider took evasive maneuvers, which enabled it to dodge my first AAM. I re-engaged the glider, and my second shot was dead on. I’m just glad there weren’t more casualties then necessary,” Capt. Watson explained.